This image by NASA astronaut Donald Pettit is among more than 40 on display at University Gallery through Imagine RIT on April 28. 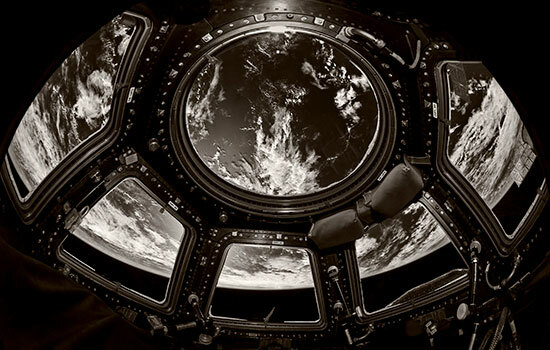 An exhibition of otherworldly photographic images taken during NASA astronaut Donald Pettit’s time aboard three space flights will canvas the walls of Rochester Institute of Technology’s University Gallery through the end of April. 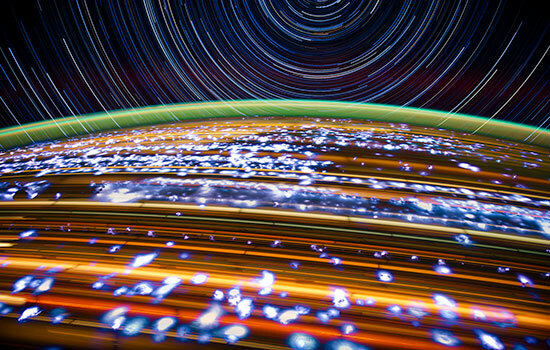 “Portraits of a Planet: Photographer in Space” features large-format views of cities at night and planetary phenomena that Pettit captured from aboard the International Space Station. The exhibit soars into University Gallery, in the College of Imaging Arts and Sciences’ (CIAS) James E. Booth Hall, until April 28. Pettit will visit campus to publicly open the exhibit at 3 p.m. Thursday, March 22. Alumnus Peter A. Blacksberg ’75 (photography), instrumental in arranging the exhibit and Pettit’s campus visit, will join him. The reception is free and open to the public. Photography has been a fascination of Pettit’s since picking up his first camera when he was 11 years old. At 62, Pettit is NASA’s most senior active astronaut. A veteran of two long-duration stays aboard the space station and one space shuttle mission, he has taken nearly a half-million photos to capture the awe of his journeys. Pettit’s innovative photographic work and passion for low light photography has changed the way we see Earth from space. The RIT exhibit features more than 40 of his photographs, some mural sized, curated by Pettit and Blacksberg. From star trails and terrestrial lights to air glow and auroras, Pettit captured many of his images using time-lapse and long-exposure photography. RIT’s Imaging Systems Lab displayed technical mastery of its own in imaging, printing and mounting Pettit’s photos to his exacting specifications. Pettit’s daylong visit to the RIT campus Thursday will include talks with students, faculty and staff in CIAS, the Chester F. Carlson Center for Imaging Science, the College of Science and the School of Individualized Study. In addition to events related to the gallery exhibit, Pettit will donate four “zero gravity drinking cups” to the Product Timecapsule archives of RIT’s Vignelli Center for Design Studies. During experiments with capillary action in microgravity, Pettit and Mark Weislogel of Portland State University invented a way to sip liquids from an open container formed like a teardrop. The cup represents the first patent granted for something invented in space. Pettit used a subsequent design for handmade porcelain ceramic versions now used on the space station. Pettit will conclude his RIT visit by sharing his experiences from 370 days of space travel during his presentation, “Techno Stories from Space,” which will take place from 5 to 7 p.m. at Ingle Auditorium inside the Student Alumni Union. His talk is free and open to the public. The University Gallery, located on the RIT campus in James E. Booth Hall, features exhibitions comprised of works that inspire creativity and spark the imagination. Exhibitions showcase work from RIT’s extensive archives, the work of professional alumni as well as traveling exhibitions. For information about this exhibit and others planned in 2018, email UniversityGallery@rit.edu or call 585-475-2866.